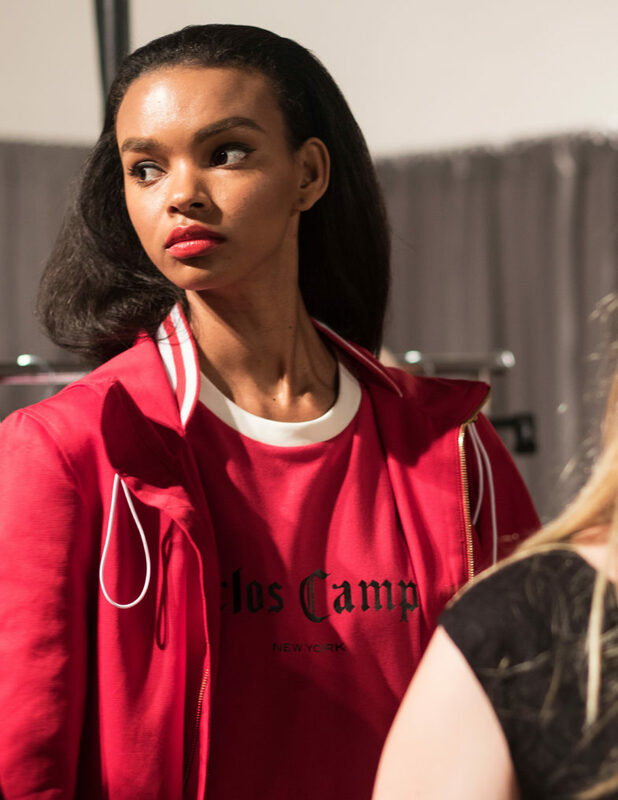 Carlos Campos is a well known influential and innovative fashion designer from New York City. 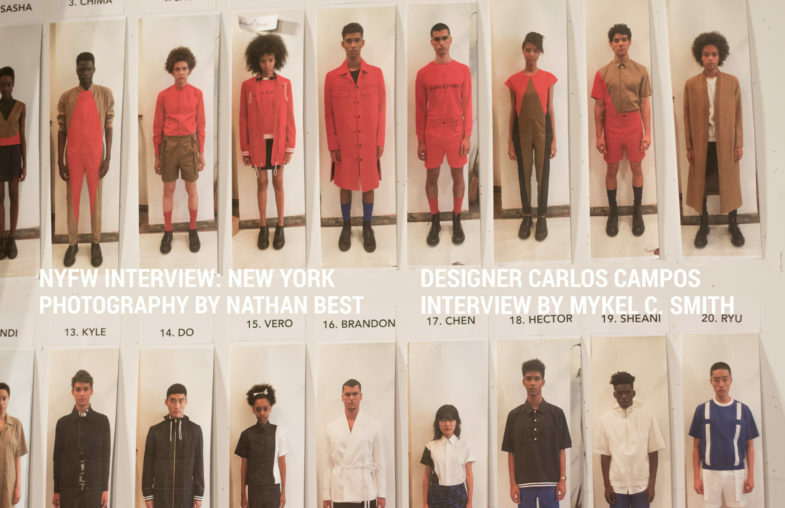 In this exclusive interview by Mykel C. Smith for Carbon Copy Issue #25, we catch up and get to know more about Carlos Campos and the brand that carries his name. 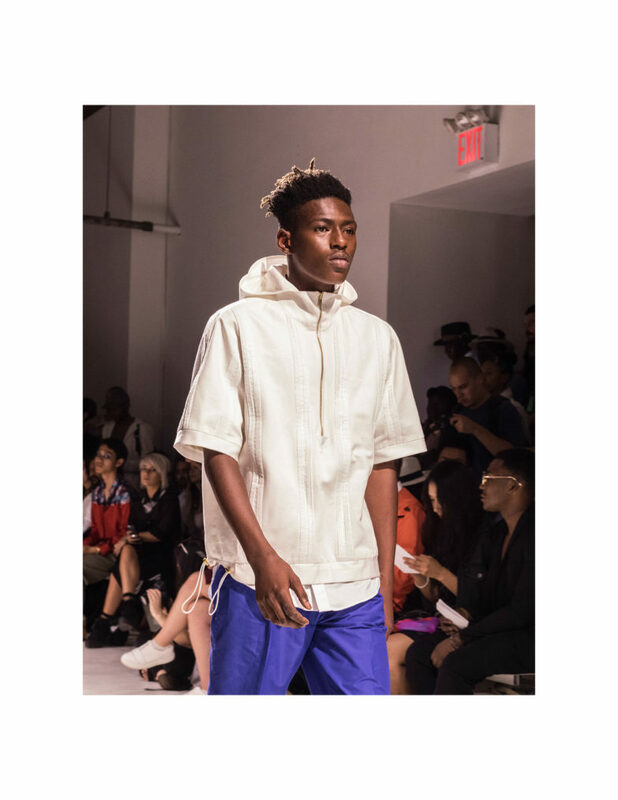 We also feature some exclusive runway and backstage images from his show during New York Men’s Fashion Week Spring/Summer 2018 photographed by Nathan Best. 1. What was your vision for this seasons collection? 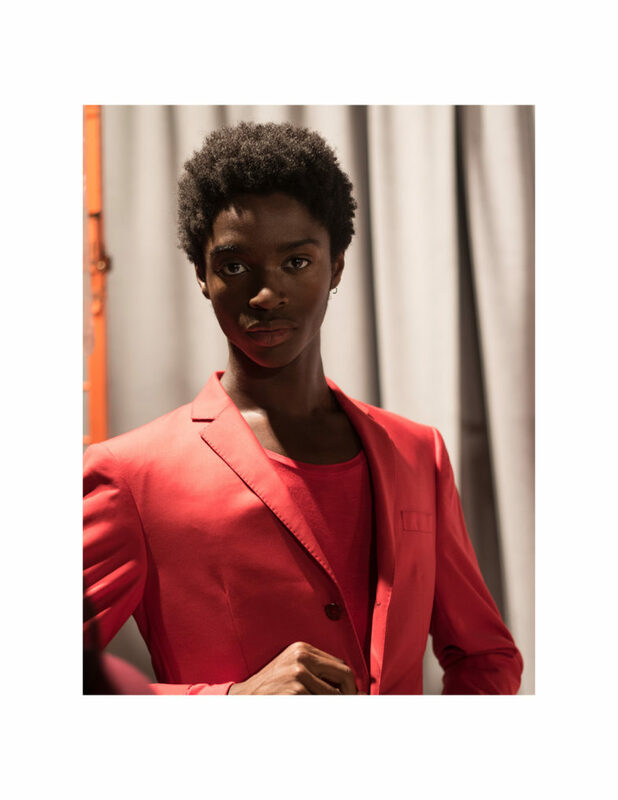 Carlos- Every collection is inspired by a Spanish Character. I like to dig into where I come from which is North America (British Honduras). This particular season we dipped into Mexico and chose Architect Luis Barrag`an. 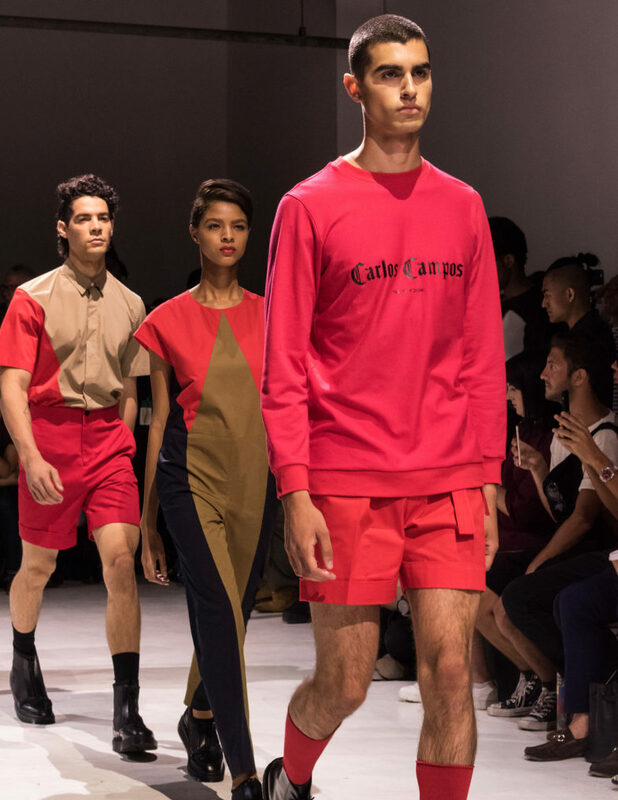 I love the way he transfers his buildings through color and this is what we wanted to interpret in this particular collection. 2. We noticed that you cast mostly black models. Gucci and a lot of Luxury brands in Europe have gotten bitten by the diversity bug finally. I know you always use models of color. I remember you once produced a show based on David Bowie and Iman. 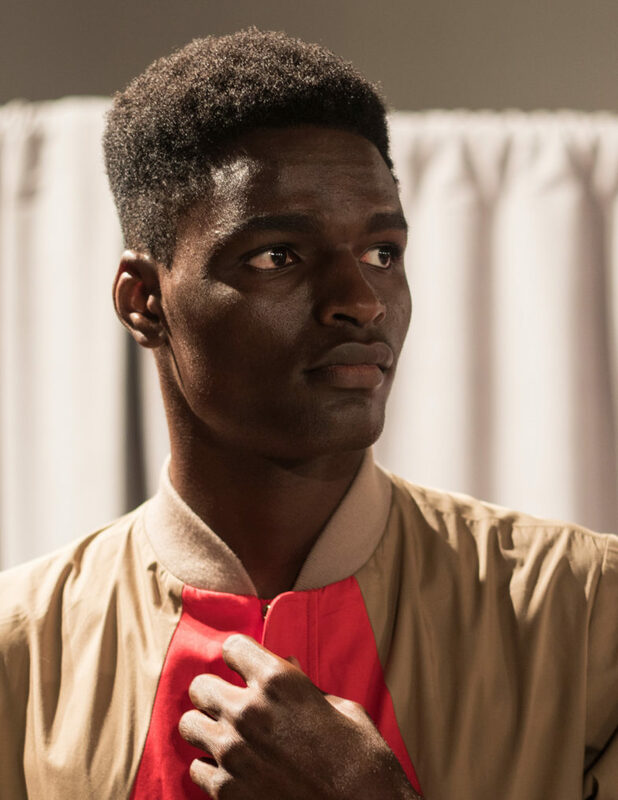 What were your thoughts this time and what are your thoughts on diversity in fashion? 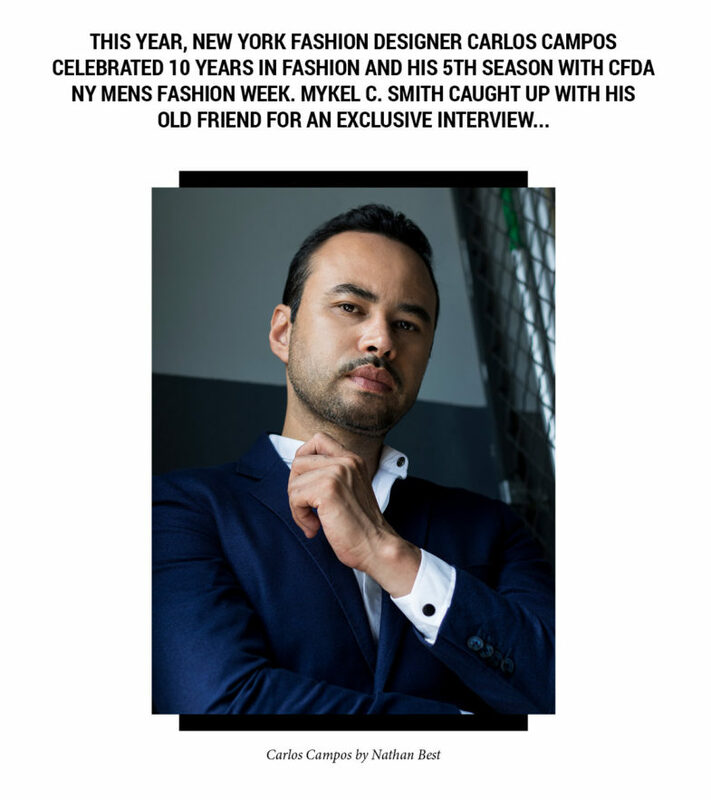 Carlos- I think it’s a very sensitive subject nowadays, but to me it was a celebration of our 10 years in fashion and our 5th season with NY Mens Fashion Week. I really wanted to be about where I come from and growing up in America. feeling that we all deserve an opportunity and also reminisce and reflect how far we’ve come – I wanted to embrace that this particular season. Also, the collection makes a lot of sense with the cast we chose. It’s just something that’s in the air for me and it makes a lot of sense with the collection I designed. I don’t want to get into politics, the models who opened and closed the show really represented who I am and what I wanted to present. One model, in particular, was India Charmain. 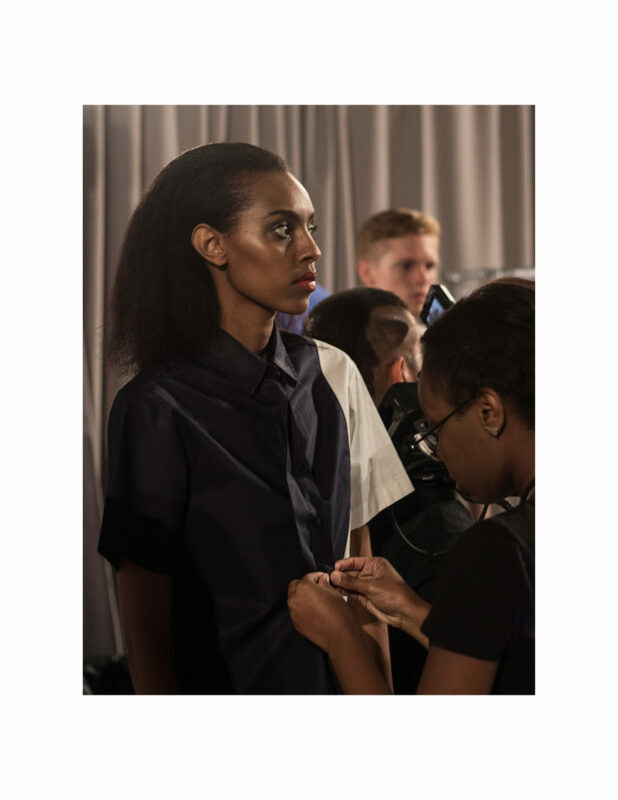 She is a great artist and reflects the collection dead on as we chose to use menswear on women as well this season. 3. You have been a long time member of the CFDA and a Vogue Award Finalist. How has that affected your brand? Carlos -I think it has put a stamp on my name. It has changed my career and opened a lot of doors on a business and personal level. You are taken more seriously and you are invited to events that before I wasn’t invited to and it really has helped my career tremendously and overall has given me a broader reach than I’ve had years before. 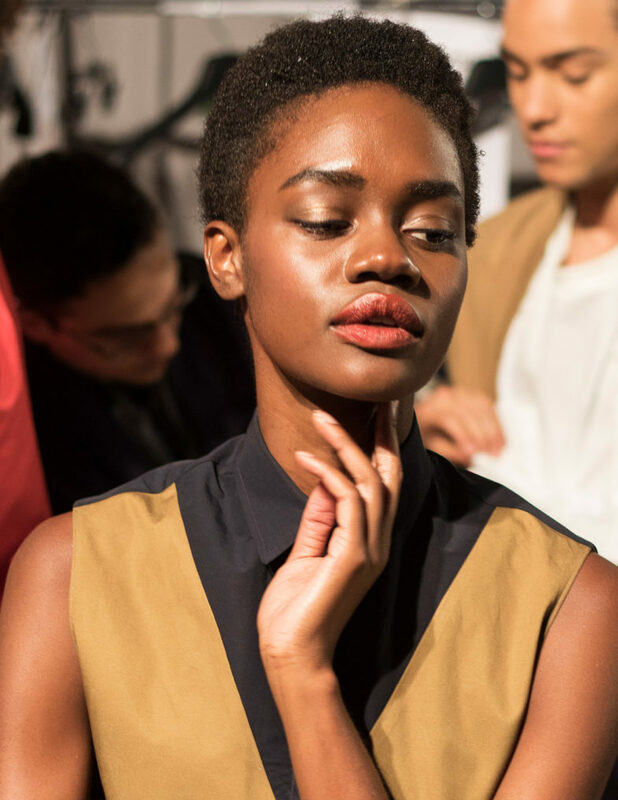 4.This is your 5th season showing for NYM Fashion Week, which recently aligned with Paris, Milan, London and separated from women’s fashion week. What are your feelings in regards to this? 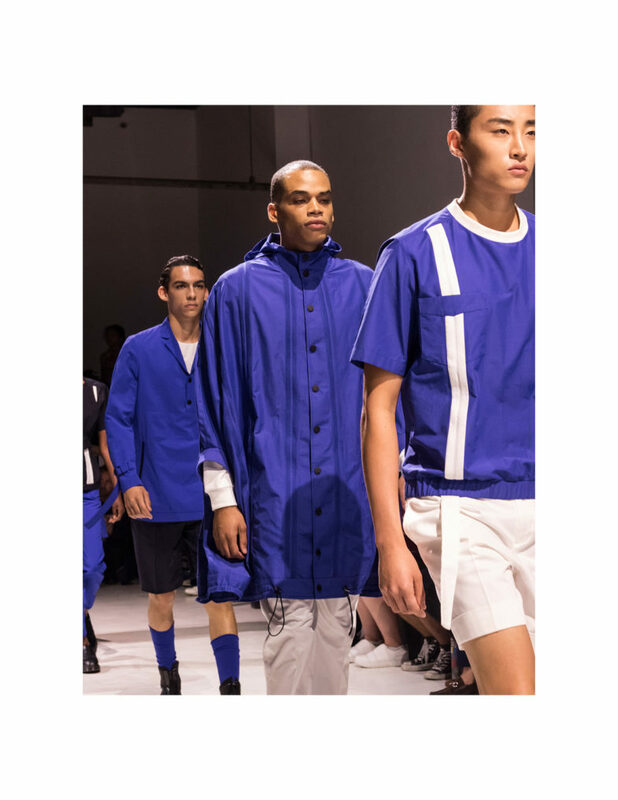 Carlos- I think it’s great for menswear designers to have their own space and time. 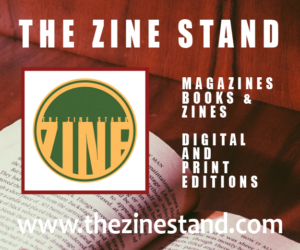 It’s a struggle for us to drive European press and American press because we are getting caught up between the European Holidays and for editors to come to America and see 80-90 designers. A lot of great talent gets lost and it’s also a financial situation as they have to return back to Europe. However, we all are making an effort to make it successful. 5. We are now living in the digital age, with social media platforms etc. Has this medium helped your sales? Carlos- I think it does help, especially when a celebrity comes to your show and talks about you on their social media platforms and their followers start following your brand. It’s a part of the business now. Sometimes we like to think that the work will speak for itself but that’s not always true. When others speak about your work, it drives the sales up as well, depending on the moment. We know people can buy followers but we have around 25k which are some great follows from all walks of fashion. 6. 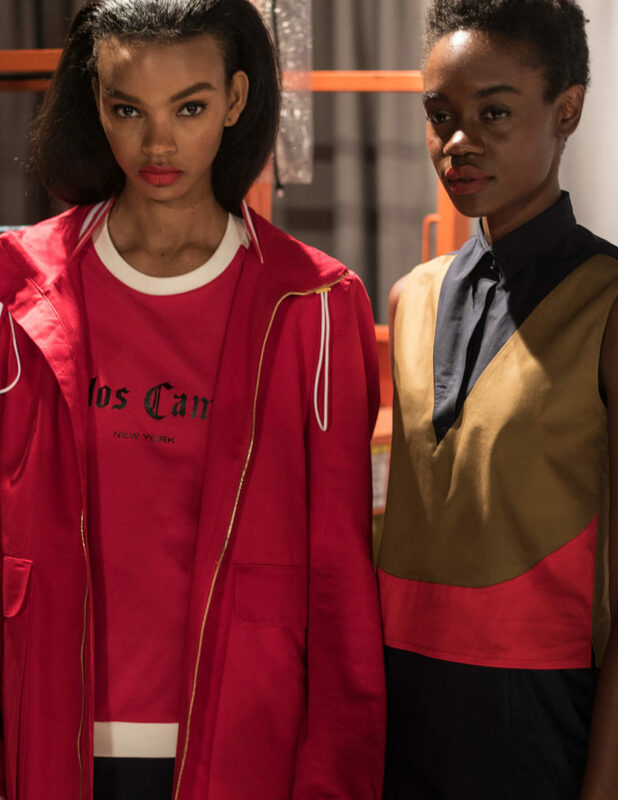 You are known for being a master tailor but everything is fast fashion and younger with designers collaborating with giants like H&M and Target. Are any collabs in your future? What stores are you currently in? Carlos- We are always looking for great collaborations. Every big designer is looking to collaborate with a big brand like H&M. You see what all the social media and press does for the designers. Everyone can have a piece of the designer. Fashion has become very inclusive of everyone, not just a select few. That is why you see the lines out of the door. It’s a great platform to be on. We definitely have more collaborations on our radar. In the past we have collaborated with Jose Cuervo. It worked out well for us as we were introduced to their customer base and we introduced their brand to fashion. One of the best collaborations was also with architect Santiago Calatrava, who designed the hub for the World Trade Center. One of our best and most successful was our collab with shoe designer Louis Lehman. We are now in speciality boutiques and the department store, Lord & Taylor. 7. Many designers are showing in California and Europe. Any plans in that area? I know you have shown in your own country a few times. Carlos- For us we always entertain the idea of doing something in Paris or Milan. We are now just focusing only in New York. We are really pushing menswear in America. We think it would be in vain and too much competition. We also manufacture a lot of our garments in New York, Turkey, China, and the Honduras. 8. You are very selective in dressing celebrities, can you give us a few names of the ones you have dressed and how do you go about the selection process. Carlos-Its a combination of a lot of things. We have dressed celebrities for red carpet movie premieres and Met Gala. We get many requests from stylists during award seasons, which is always great for us as well. Vogue calls us and ask who we are dressing for certain events etc. We most recently dressed Ismael Cruz Cordova who stars on the Showtime hit Ray Donovan. It’s no specific procedure. We just go with who we feel fits our brand. Carlos- We are still decompressing from this past season. We are in sales right now a well. We have a few characters though that we love – there is a famous musician whose style we like. We are presently looking into his life and seeing what we can come up with. 10. From our years of friendship, I personally know you have dated the same wonderful woman for years. Any plans for marriage, children etc? And what do you do to relax? Carlos- I think I want to experience everything in life; marriage, children, that’s part of our agenda. I have been with Megan Key for 14 years which is like 50 years in fashion. She is the creative director for Dolce Vita. I go to a lot of events but I go with her. She’s a friend, advisor as well as a lover. I trust her. She’s so important to me. As you know friends and family are very important to me. I travel a lot, that is how I relax. Thank you so much, Carlos. We know you have a great future and another fabulous 10 years ahead.